More thoughts about The Art of Scent 1889-2012 Exhibition at The Museum Of Art and Design in NYC. Calls us fragonerds, fume-heads, cogno-scenti... As someone who blogs about fragrance several times a week I'm a card-carrying member of this club. We love perfume and want to talk about it. A lot. We often find ourselves explaining to doubting friends and family that perfumers are artists and their work makes one feel and think. That there are cultural aspects to perfumery, cross-disciplinary connections and associations, and it's just like high fashion: an Alexander McQueen gown or Karl Lagerfeld jacket can be art. So can be a fragrance made by Christopher Sheldrake or Edmund Roudnitska. We can talk about them for hours and we want to share this passion with the world. What's better for this purpose than introducing a Department of Olfactory Art to the Museum of Art and Design in NYC? The first exhibition of the department attempts to chart "the major stylistic developments in fragrance design to the present day" by showing milestones in perfumery in chronological order, starting with Jicky (Guerlain, 1889) and ending with Untitled (Maison Martin Margiela, 2010). It's what happens between these two that makes me raise my eyebrow and wonder what went wrong in showing a brief history of modern scent. History is written by the victors, and it's painfully obvious who they are in this context. The heavy involvement of the department's sponsors, from major perfume brands to large manufacturers of odor molecules (these companies are the employers of many perfumers). They all have a commercial interest in presenting their work as the biggest scent achievements, making the visitor familiar with their products and learning how the public responds to them. But is this a good enough reason to choose these particular fragrances as the major scent events of the discussed period? The questionable selection (Light Blue? Really?) becomes even more evident when one considers that the exhibition and the Department are trying to push perfumery as art (I'm not arguing with that). It would make a lot more sense then to include works by houses and perfumers who are actually focused on the artistic aspect of fragrance and less on topping sales charts at the malls. I'm not even talking about the dead past (Jacques Fath, Germain Cellier, Christian Dior, Edmund Roudnitska, Francois Coty, Henri Almeras, Ernest Daltroff, Bernard Chant...didn't they change the world of scent? ); but what about creative forces such as Serge Lutens and Frederic Malle? The latter is a publisher of perfumes who commissions works of art from some of the greatest perfumers of our time. Meanwhile, Lutens gave new life to orientalism at the exact point in time you'd have expected this style to disappear thanks to Angel and L'Eau d'Issey. I'm not even talking about the decades missing from the exhibition or the complete denial of the role of natural raw ingredients in perfumery as an art form. I see The Art Of Scent 1889-2012 as missed opportunity. There's so much to show, explain and share with the public, fragonerds or not, but Pleasures and Drakkar Noir are not part of that. See more thoughts about the exhibition by Jessica on NST and Avery Gilbert on First Nerve. Gaia, it's posts like this that make me adore you and your blog more and more! I find it terribly annoying that Burr is trying to pass this off as a representation of "perfumery as Art" without any mention of perfumers such as Christopher Sheldrake, Jean Claude Elena, Olivia Giacobetti, or as you mention Frederic Malle and Serge Lutens who have had such a profound role in modern perfumery. And yes, Burr's utter dismissal of natural materials is baffling. It's like he's dug a hole he won't allow himself to get out of. I love one of Avery's comments on his blog (thank you for that link BTW) "Burr's exhibit is deeply reactionary. It's an attempt to hyper-intellectualize perfume, drag it into the museum, hang it on the wall, and let him be in charge of the discussion." Although maybe it's not just Burr in charge of the discussion, but the major corporations as well. It's great to hear your opinion on this contentious exhibit. I believe everyone can agree that the major disconnect between intent and presentation is the main issue at hand. When the list of fragrances exhibited was published I was taken aback. Light Blue? Drakkar Noir? Untitled? Even L'Interdit seems redundant next to No. 5. In regards to Mr. Burr's appropriating of terms from other artistic formats? I'll let that speak for itself. "Light Blue" represents kinetic sculpture. Funny, I've only got hairspray from it over all these years. I was excited when I started reading about the idea of an exhibit of the art of scent and then was disappointed. As a fragonewbie I'd like to learn about key scents, their history and compositions, I'm not so interested in the ones that I am assaulted by when I walk into the fragrance section of the department store. Don't get me wrong, I do like some of them and wear them but I'd like to know about who started it all and the innovators of scents. Gaia, you and Scent Hive make excellent points that I did not even think of as I puzzled over this exhibition. Of course Chandler Burr would not be wide-ranging in his selection of fragrances - he's going to pick them from the fragrance houses that are paying for the exhibit, and claim that they are the best representatives of innovation and the art of fragrance! I was pretty shocked when I read the scents that were chosen for the exhibit! Some, like Angel, are arguably milestones. And it's well known, and polarizing. But overall, the exhibition is so clearly bought and paid for by large corporations that its importance as art is...negligible. I agree, an opportunity missed, money won another round. I was hoping you would share your opinion on this exibit :) Even if I happened to be in New York this winter (sadly, that won't happen anytime soon), I most probably wouldn't bother going to this pretentious thing. Empty white walls and perfumed "urinals"? 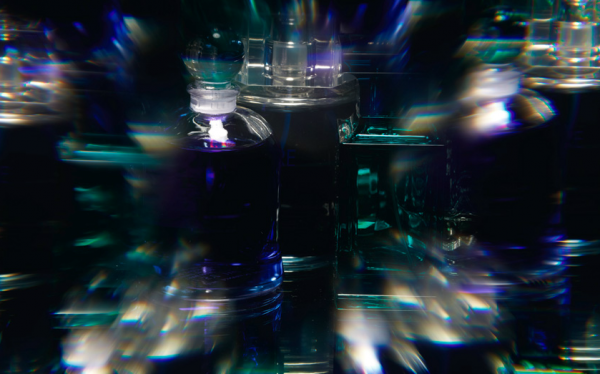 Synthetics started the age of perfumery as "Art"? Oh please. And, most importantly, where the hell is Mitsouko? Where is L'Heure Bleue? Bandit? Fracas? Miss Dior? (we all could go on for a long time, couldn't we). Actually, Avery Gilbert makes a very valid point: you cannot separate perfume from context. What do Angel or Chanel № 5 mean without the general cultural and aesthetic sensibility of their respective periods? What exactly are they supposed to mean in an empty room, to people who don't know that much about perfume? It really does reek of a missed opportunity (pun intended). I think you need to realize that museum displays are ALWAYS highly politicized, and must be seen by most of the general public as politically acceptable or meeting a cultural norm. These people are under many constraints and must have their choices vetted by people who probably know nothing about the subject. This display is NOT the product of one person. That having been said, of course those of you who are really into fragrance are going to view the collection differently than the average patron, and probably consider it banal and boring. Bear in mind, though, that you are a very small and eccentric minority, and the exhibit is not geared to your level of knowledge and experience. And don't forget that the perfumes you're disparaging were and are still very popular and familiar to the public, which makes the exhibit a better draw than one that would please you. Museums need money to survive, too. I think I'd be glad that a very well known and well respected museum undertook this exhibit and regard it as a first step toward a more in-depth investigation and an evolving exhibition. Iron Maiden, I think what perfume enthusiasts are saying is the the exhibition declares itself to be about 'olfactory art' but in fact the perfumes selected for inclusion are not the best examples of 'olfactory art' at all. The choice seems to heavily influenced by commercial considerations. The fact that some - many - of the perfumes have been popular successes will please many visitors, but it ought to be irrelevant - according to what we are led to believe by the curatorial voice of the exhibition. That is the central hypocrisy of the exhibition that many perfume enthusiasts have identified. However, I agree with you that this is just a first step in what sounds as if it will be a series of programs and presentations on perfume by this museum. I have spent a career in museums and grapple every day with museum politics. You are right: what you see in exhibitions is never the result of the work of one person and there are many factors that influence what is put on the walls and into showcases. But of course the visitor does not know that. Visitors make their judgments based on what they see on the day of their visit. How can they do otherwise? The challenge for curator is to make that a satisfying and coherent experience. Very difficult. I've been bemoaning the fact that I probably won't get to see this exhibit, but after reading your post and that of others it sounds as though I'd kick myself for going. As someone who works exclusively with naturally derived compound aroma chemicals and isolates (or as you describe them: natural raw ingredients), their dismissal and the sterile work of Diller and Scofidio would probably result in a Munchian Silent Scream on my part. Perhaps we natural fumers need to spiffy up our nomenclature if we want to get some RESPECT.